his product contains 27% nitrogen (N), of which 13% NO3, 7% NH4, and 7% NH2. Besides nitrogen, N 27 also contains 1% Magnesium (MgO) and the trace elements iron, manganese and copper. The importance of nitrogen should be a well-known fact for all cultivators. Nitrogen is quantitatively speaking the most important fertilizer as it is, e.g. the primary substance of proteins (amino acids) and chlorophyll. Furthermore, nitrogen appears in the chromosomes (nuclei), DNA and vitamins. It also plays a significant role in the plant’s osmoses regulation. A deficiency of nitrogen manifests itself in the fading of the biggest leaves and a too early blooming. An excess results in dark green leaves and a slow growth. It is of great importance that when nitrogen is used as a fertilizer, the appropriate form is used. 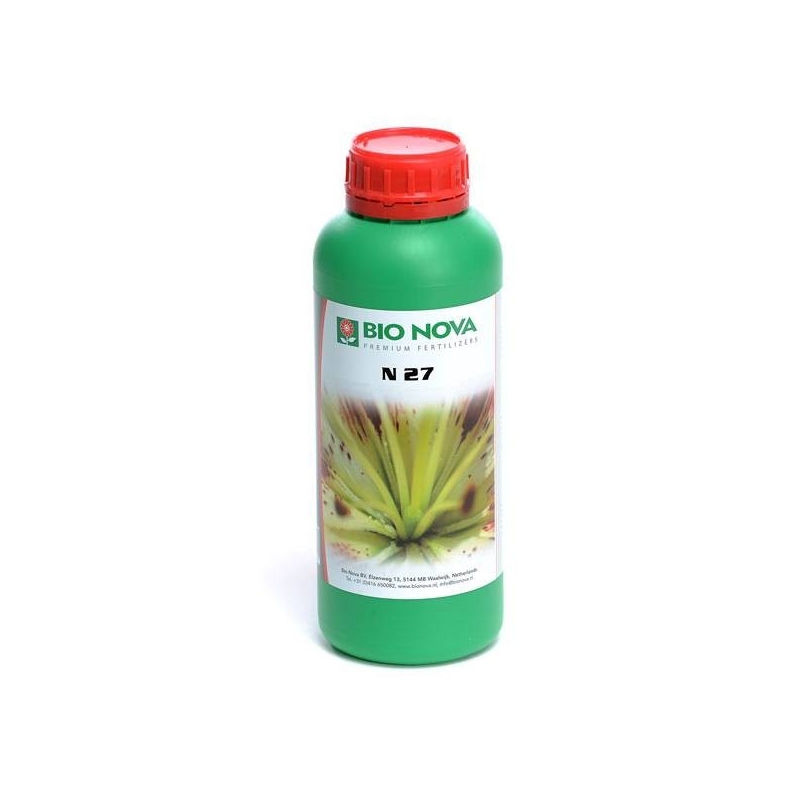 Bio Nova offers a very powerful liquid nitrogen fertilizer enriched with magnesium. This product is one of the various well-known Bio Nova liquid mineral fertilizers.